Enough with Dice-K and Big Papi! Dice-K is 1-4 in 2009. I need to come out and say it. Dice-K and David please ask for a trade or buy out your contract as soon as possible! I mean it! Please guys, just do this for our wonderful city. For all those beloved Boston Red Sox fans that just cannot stand watching you on television, hearing your name on the radio, or reading your stat line in the Boston Globe. Enough gents, please just leave! Dice-K, I really wonder if you enjoy pitching for the Sox, I really do. Is it the mound shaped differently in America? Are your cleats not as comfortable as they were three years ago in Japan? Are the members of the working press asking you tough questions? Getting enough sleep at night? David… David, David, David, (Wow, I am sounding like Jan Brady here), so you go to get your eyes checked, have Tito rotate your throughout the line up, and only have two homeruns so far? What is wrong with you? As you can tell, I am sick and tired of watching both of these Red Sox players and well… will just have flip the channel whenever I see either of these players in action! I will be at the game tomorrow evening and thankfully will be home for bed on time because Dice-K won’t be pitching and hopefully Ortiz won’t be hitting! I fully understand your disappointment and frustration toward Matsuzaka. I cannot stand to watch him pitch. His five tedious innings game in and game out infuriate me. But this last start against Texas gave me hope. Sure, he gave up five earned runs to the best offense in baseball. But he didn’t walk a single batter and struck out eight. The zero walks is huge for him. If he can keep that stat up he will be superb against most teams and pitch well into the 7th inning. He comes from a league where the refusal to give in to hitters is paramount. That is what he tries to do here, but the end results are walks and a very high pitch count in only a few innings. The ball is different in Japan too, as well as the starting rotations (6-man rotations). This is why Matsuzaka is frustrated also, because he is used to throwing a lot of pitches in a game. In America, we baby pitchers and once they hit 90-100, the organizations pull them. 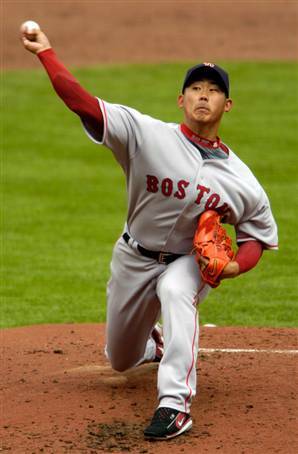 It is a learning curve that has yet to fully realized with Matsuzaka and the Red Sox, but hopefully the zero walks last time out is a spark. Nice work, Noonan.